Exports and syncs SharePoint lists, including details of field changes and version history, with SQL and other databases. Synchronize SharePoint lists with just about any database. Export the version history of list items for auditing and regulatory purposes. Include important information such as what items were changed, which fields were modified, what the old and new values are, who made the change, and when it was made. SharePoint’s native Auditing Logs do not include this information! Use Crystal Reports, SQL Server Reporting Services, or other tools to generate comprehensive, detailed reports and audits on the SharePoint data. Try before you buy. You can download and install a full-featured, 30-day trial version. We will send you a license key for permanent use upon purchase. 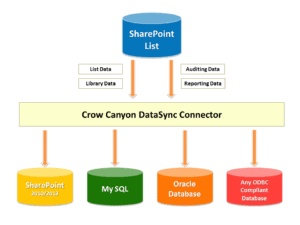 Crow Canyon DataSync for SharePoint can export SharePoint list to any external ODBC-compliant database. It provides continuous synchronization and updating from SharePoint to the database. DataSync has extensive and powerful capabilities to audit modifications to any SharePoint list or library. The tool exports versioning data on all list and libraries items. This provides a complete record of all changes to items in a SharePoint list or library. DataSync can connect to any ODBC-compliant database, such as Microsoft SQL Server 2000-2008 R2, Oracle Database, MySQL 5.0 Database and SharePoint 2007/2010/2013. Map data between SharePoint list columns and external database fields to ensure that information is synced accurately. Decide which fields to include or exclude from sync. Data transformation process manages data type transitions from SharePoint to database. SharePoint’s native Auditing Logs are not available in SharePoint Foundation. DataSync uses timer jobs to run automatically in the background. Change are updated according to a schedule, thus always keeping data up-to-date. End users can securely access data from SharePoint list after connecting to the external data source. Users can then create, read, update and delete external data from SharePoint list. Access and manage all DataSync jobs from one central location without entering each site or list individually to configure the settings. Administrator can track and record errors by setting a log schedule or by enabling email notification so that they will be notified whenever an error occurs during background updates. Fully compatible with SharePoint 2010 and 2013 Foundation/Server/Enterprise. The Crow Canyon DataSync Tool is installed directly on a SharePoint server as a Windows application. It is licensed for one installation on that server. One installation can support multiple data connections (SharePoint list to Database). You do not need an installation for each server in the SharePoint Farm, though in some cases, you may want to run different instances of the application on more than one server. The database and the reporting tools are not part of the DataSync purchase. Server License with Annual Support entitles you to install the application on one SharePoint server. It includes support, which means the right to contact us for support within one year from date of purchase. Bug fixes and minor upgrades are included with the Server License. Annual Support Renewal renews annual support for another year. This renewal is made after one year.